Yes, it's me. I'm still alive! See? Sorry about the extended vacation--I didn't plan to be away so long, but life intervened in a really good way. My son came home for summer and I wanted to enjoy every single precious moment with my family. How could I be sitting in front of my computer when moments like this were happening out in my husband's office? 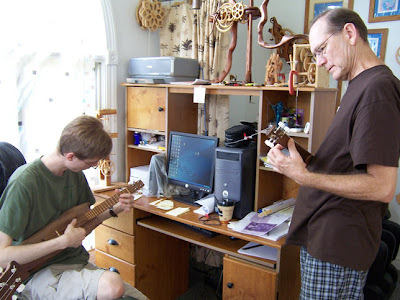 Father and son jamming on their various ukes built by my husband. Angela was playing too (she's over to the left, just out of this picture), while I was soaking it all in. 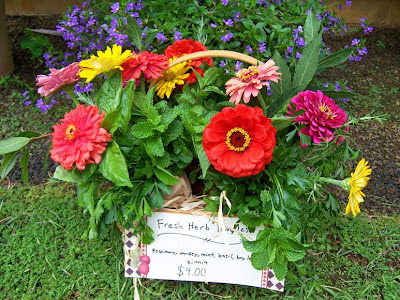 Grayson and I also had a teeny tiny fruit/vegetable/herb stand for the summer. We made Grayson a little pocket change for college this way. Obviously, all of us wanted to relax and live in the moment. Grayson goes back to college in a couple of weeks, so I'll probably have more time to blog once I get caught up on things. Actually, it was Grayson that fervently suggested I update my blog today--he didn't like that you were all concerned about me. I wrote a few of you individually and tried to explain, but as always, I got overwhelmed by email and had to give up for a while! Somehow, I have to try and find some balance. 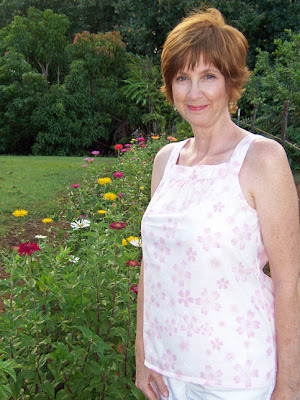 Please bear with me while I re-group and figure out how to participate in Blogland again. I do have some wonderful "What I Did on my Summer Vacation" pictures to share with you! Perhaps in a couple of weeks, I can start posting again with some regularity. In the meanwhile, I'm going to enjoy my son's last couple of weeks at home and try very hard not to get too sad when we have to put him on the plane again. 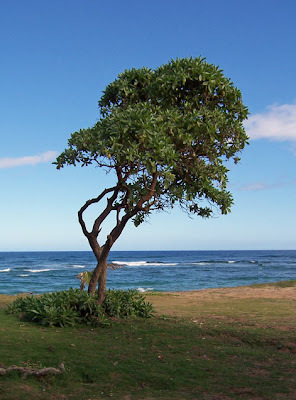 Aloha and A Hui Hou for now. 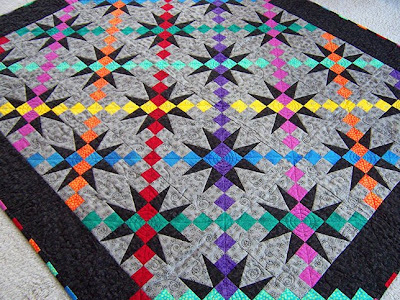 This quilt was such a pleasure to make. 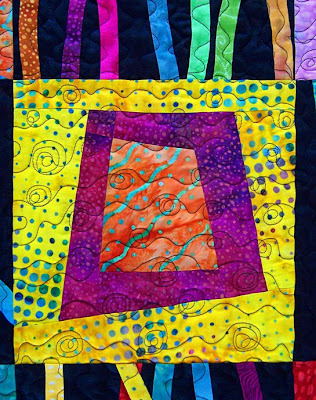 What a fabulous pattern, Marsha! I love it. Thank you for making it available on your website, and thank you for your fabulous tutorial. The only modification I made to Marsha's pattern was to leave off one row at the bottom, due to size/hanging considerations. The quilt just glows, doesn't it? For drama, nothing beats batiks on black. I'm not crazy about the thread I used to quilt this quilt, I would've rather used a thicker thread, but my machine-on-a-stick does NOT like quilting through batiks. It took me longer to quilt this quilt than I would've liked because I could only quilt a few feet before the thread would break! 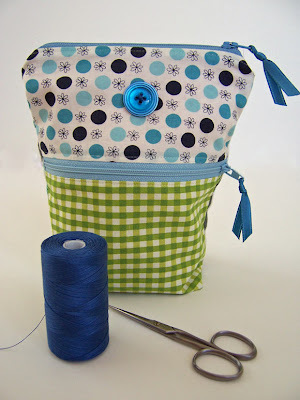 I spent lots of time with the seam ripper before I switched to a thin poly thread--but even then, lots of breakage. I left a few more black gnarly balls on the back than I care to admit. Argh. 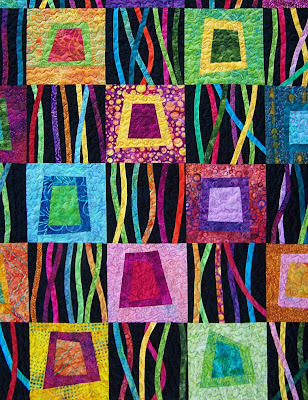 I quilted squiggly vertical lines on the squiggle block, and horizontal wavy lines with little eyebally-looking things on the box blocks. Sort of like how the water would flow around swimming jellyfish . I got stung by a real box jellyfish once. It stings for hours! But I don't hold it against them. I think they're beautiful. 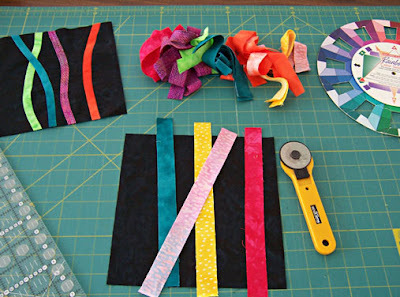 Here's a confession: every time I quilt a quilt, I think to myself, "this is the WORST quilting I've ever done. Look at all these mistakes. I give up--I just want to get it done and over with! Perhaps I'll hang it so you can only see it far away..." No lie. Every time I quilt something. But then I step back instead of being right on top of it....and it's okay! Not brilliant...but okay! And DONE--which adds to its appeal. 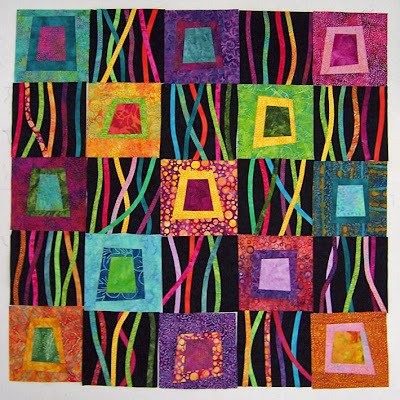 DONE and FINISHED is good when it comes to quilting. Mistakes are secondary. Marsha suggested a colorful binding and I agreed! 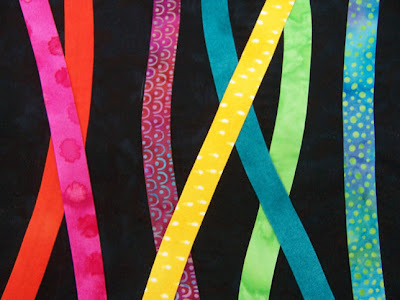 But instead of using a colorful fabric, I just sewed together my leftover squiggle strips and used them as my binding. Off they swim! Bye bye Box Jellies! Don't tell anyone who quilted you!!!! I've been SO busy. I know I've been a bad blogger, but that's how it'll probably be until Fall, unfortunately. Right now, I have lots of pattern orders, visitors, teaching requests, my son will be home soon (yay! ), and I have some home improvement projects that I want to get done. I'm also trying to squeeze in some extra exercise and reading time, because that helps me deal with the stress of being so busy. Some people thrive on being busy; I am not one of those people. I do not like being busy at all. I like time to dream and think and read and create. Time to drift around the yard and enjoy the flowers. Time to clean out drawers, time to play with my cat, time to enjoy my family. So sometimes, I have to withdraw and purposefully slow down! It's a funny thing, this slowing down business. I just have to consciously apply myself to it periodically! Without noticing it, I speed up slowly every day--obligations creep into my schedule, new projects vie for my attention, new ideas pop into my head that want to be explored, to-do lists are generated...and pretty soon, I'm overwhelmed. It grows exponentially. And then I find myself neglecting the basics: my home, my health, and my joy. So please excuse my infrequent blogging while I re-focus. Blogging and visiting blogs is definitely part of my joy (I love all you guys! 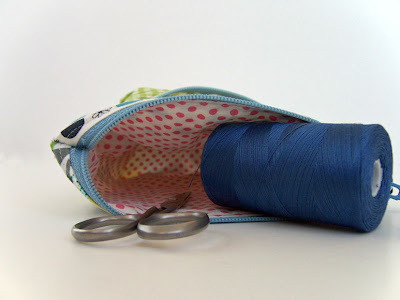 ), but my posts will be occasional, since my ability to sew and craft something to show you will be occasional also during these very busy Spring/Summers. 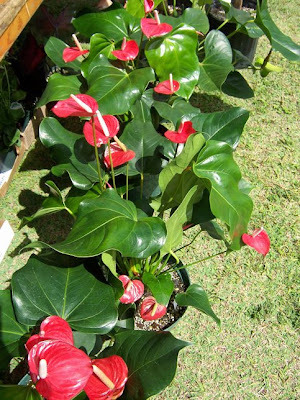 Today, for instance, will be spent printing, folding, and tying patterns, going to the post office, writing up class plans, delivering teaching materials to Kapaia Stitchery, grocery shopping, and picking up an new DVR box from the cable company. A thrilling day, no? Life in Paradise. My Green Monkeys are finished! I loooooove them. 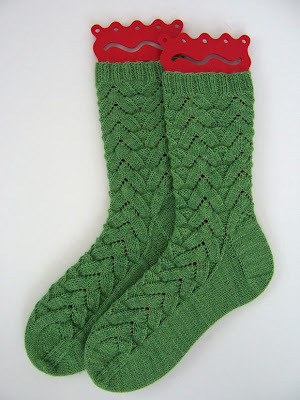 The yarn is Lorna's Laces "Carol Green" and they're from Cookie A. 's free and extremely popular "Monkey" pattern. I made two mods: one was to add an extra repeat in the leg section to make them longer, and I did 2X2 ribbing instead of 1X1. They're funny and bunchy when they're not stretched out like this, but put them on, and they're gorgeous! I would need to change the ankle next time, though, as I have to stretch them a bit to get them over my ankles. Cookie A. must have tiny little ankles...I don't have tiny little ankles. I have tree trunks for ankles. And I don't need sock patterns to remind me of that fact, thank you very much, Cookie A. Let's you and I go walking in a hurricane one day and see whose ankles keep them from blowing away, shall we? Harumphh. Bee-yooo-tee-ful pattern. Thanks, Cookie. You're amazing. 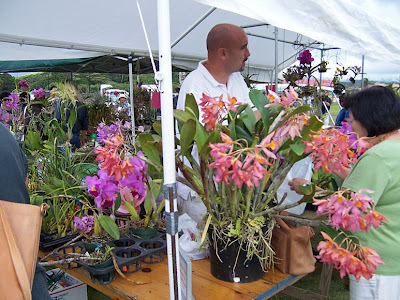 I love that salmon-y pink orchid! Gotta have that one. And look at these gingers! That fuzzy one on the left kills me. It looks like some sort of alien that pops dramatically out of human stomachs occasionally. It hasn't happened to me personally yet, of course, I've just heard. 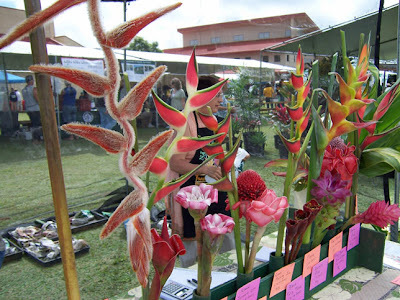 Above is a torch ginger. It's huge! 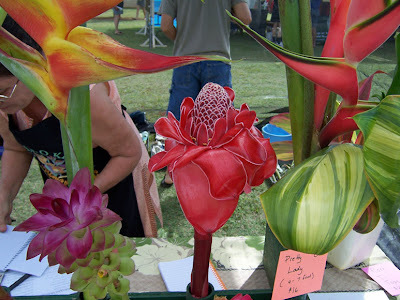 You can see why it's called "torch" ginger, huh? It looks just like a lit torch. Why mittens, of course! I'm not going to wear them, I just want to make them! 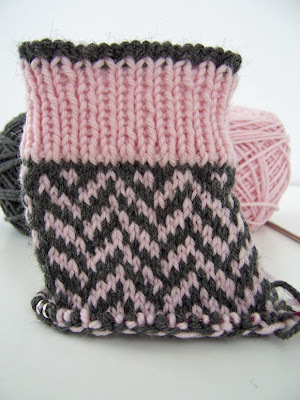 These are Elliphantom's Herringbone Mittens, available on her website for free (thank you, Elliphantom.) I think the fascination with mittens is the intricate patterns and colorwork in such a small project. This is my first stranded project and I'm hooked. 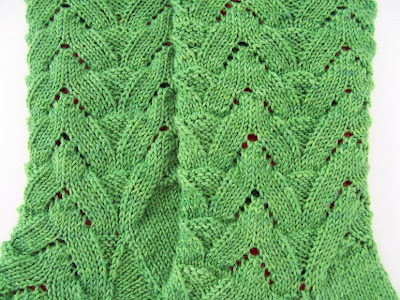 It's fun watching colorful patterns develop under your knitting needles as you knit. Addictive. I'm still Squiggling, so I thought I would pull a quilt out of my trunk to show you. 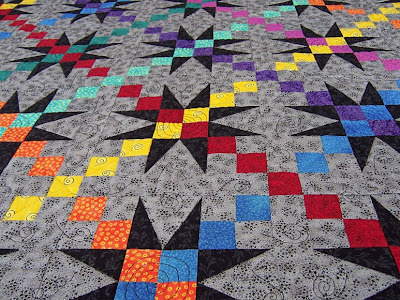 This is my Fifty-four Forty or Fight block quilt, which doesn't have a real name except for maybe, "Little Spaceboy Star" or something like that. 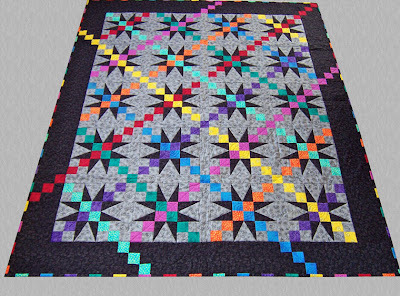 I just wanted to play with the block when I started this quilt, but then I had a border idea, so I was compelled to finish it. I made it with a little boy in mind, can you tell? The background fabric has silvery shooting stars. The silvery gray color reminds me of spaceships and robots. Do you see how I did the border? I just inserted nine-patch blocks at key places in the border to continue the some of the diagonal squares. 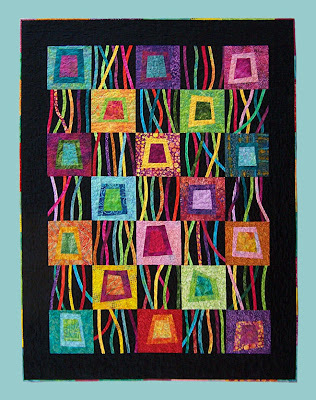 I quilted diagonal lines in the colored blocks to emphasize the diagonal feeling of the quilt. 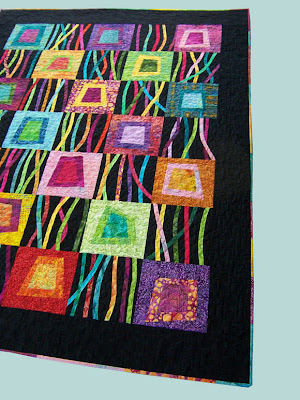 The rest of the quilting is just a bunch of little spirals. It's "tacked" between the diagonal lines with tiny spirals. I really, really like my binding. I used up all the leftover colored squares I cut for the top and alternated them with with black squares to make the binding. It looks a little like a board game, doesn't it? I'm sure a little boy would invent all sorts of games and stories while he jumped his little Lego spacemen from one star to another, being careful not to fall off the colored squares and into the gray void. 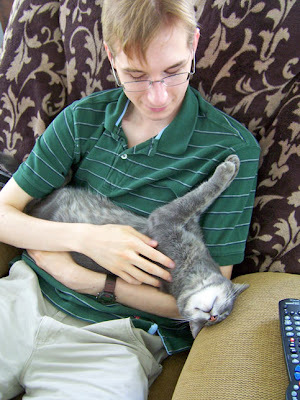 Just a short post tonight--for some reason, I am falling asleep at the computer keyboard. 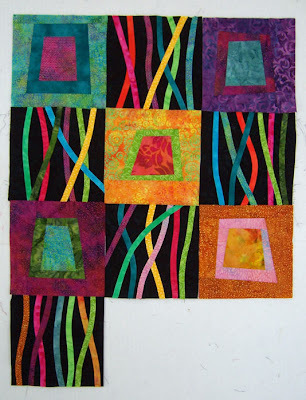 I did errands today and worked a little bit on my Squiggles quilt, so I don't have anything new to show you, either. A day late and a dollar short as the expression goes. I love this fabric! It's so happy! And what did Mr. Pouchy eat for breakfast??? My eyeglasses! Well, one of my many pairs of glasses, that is. 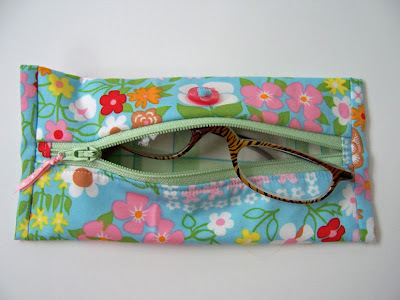 I have to keep a couple of pairs of eyeglasses in my sewing drawer. I also have to keep a pair in my knitting caddy, a pair by my easy chair, a pair on my nightstand, and...well, you get the picture. I'm obviously over forty. 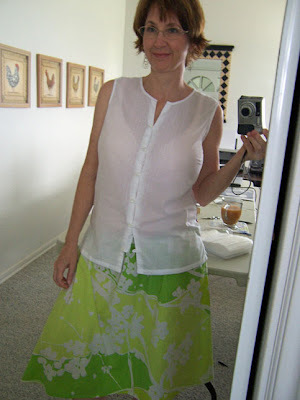 I like all the different fabrics together. I figured out how to engineer this thing so that both linings were finished inside--no raw edges. It was an origami puzzle! 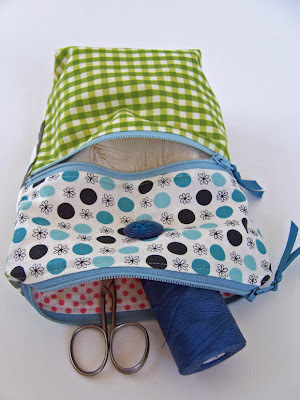 Zippers are not all that difficult, especially if you're not setting them in a dress or skirt. 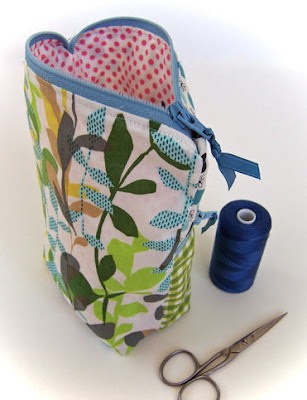 You basically just sew fabric to each side of the zipper and sew across the ends! Nothing to it. Easy. "It's Easy Once You Know How." Life is about learning. I truly believe I can do anything I set my mind to if I think and try hard enough. Knowing this in my heart keeps me going every day. Some learning curves are steeper than others, but nothing is impossible. If you are reading this, consider yourself tagged and try to think of a six-word memoir on your blog. It's an interesting exercise. 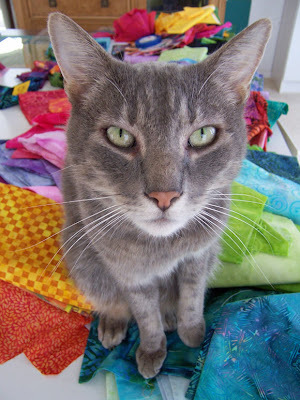 Here's a picture of my favorite sewing room companion, Mr. Bigglesworth. Doesn't he look soft? He is. He's such a sweetie. Nice picture of him too, eh? The reason I wanted to show you this picture of Mr. Bigglesworth today (other than the fact that I think he's incredibly handsome) is that I wanted to offer you some picture-taking tips. First of all, a disclaimer: I am NOT a good photographer. I've never taken a class, read a full book on picture-taking, know what an ISO is, or what constitutes a "good" lens. I have an inexpensive point-and-shoot camera that is always set on "auto." That disclaimer out in the open, I want share some of the things I've learned that have helped me take some passable blog pictures. Take or leave any advice, and consider the source. You've been warned. I LOVE my camera. 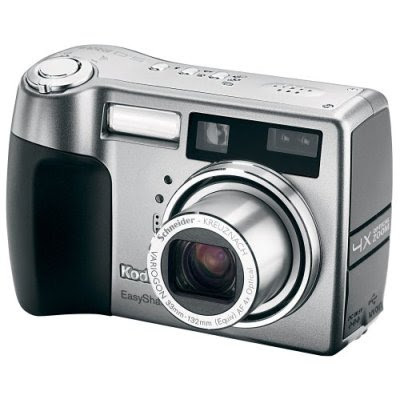 Our family has owned three Kodak Easyshares, and they've all been fantastic for our skill level. I previously owned an expensive and complicated Canon A70 camera, but I could only manage blurry pictures with it and it died a horrible death after only one year! (It stayed alive only long enough for the warranty to expire.) I'm glad it died. I hated that thing. My Z730 camera is a couple of years old now, so there are newer, more megapixel versions of my camera, like the Z1285 . If I lost or broke my camera, I would get the Z1285 to replace it. 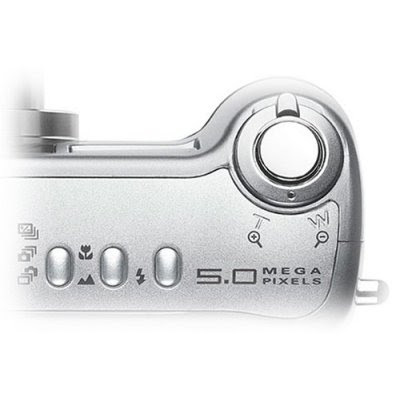 Whichever camera you choose, make sure it has a close-up feature on it. See the picture of my camera below? See the flower and the mountain? The mountain is for far-away pictures, and the flower is for close-ups. When I turn my camera on, the focus is set somewhere in between "flower" and "mountain," so if I want to take a close-up, I push the flower button. Everything else stays on auto! On your camera, it may say, "close-up" or "macro." Find it. It's soooo important. The close-up feature lets you get up close and personal with your subject. 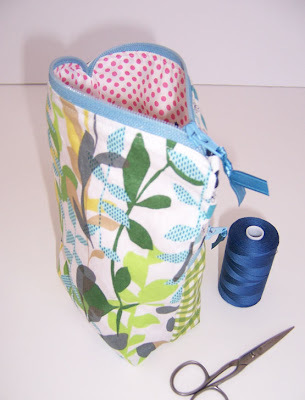 Look at this close-up of my pouch. I love close-up pictures; they really draw you in. So often, people stand too far back and you can't see any detail! 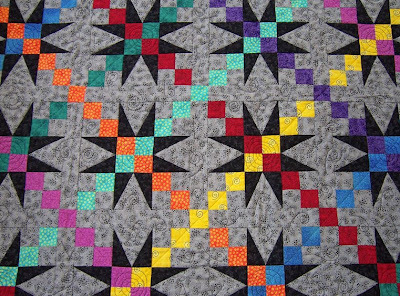 When you go shopping or look at a quilt in a show, don't you like to get really, really close? I know I do. The next thing you should do is turn off your flash. Leave your camera on the auto setting, but just turn off the flash feature. Flash is horrible. It burns out color, startles the subject, turns eyes red, wrecks the background by making it too dark in the distance, and "flattens" the subject. Of course, if it's too dark, you have to use flash...but try turning it off if you can. Natural light is softer, the colors are truer, and the subject has so much more depth. And below is the flash version. I didn't turn on the flash on purpose, it came on automatically. I have to turn my flash off on purpose in even in slightly diminished light--it wants to flash even though there is sufficient light!) See the shadows? The washed-out fabric? The "flat" look of the whole picture? I'll admit, this is not the greatest example, but I think you'll see what I mean if you really start looking at great pictures and see how natural light gives them much more life. 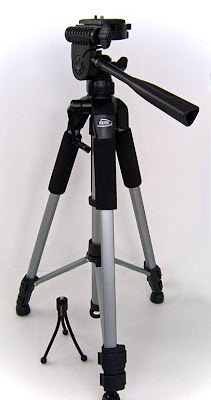 Tripods are not just for professionals. I have two tripods and I use them both. They're essential! It's so hard for me to hold the camera still when I take a picture, especially in low light. A tripod steadies the camera so you can use natural light more, even in low light situations. I have two tripods and use them all the time. The little one is a gem! You can use it on tabletops, put it on shelves or stacks of books, or even steady the camera on your chest while taking a picture. Another essential item is white foam core board. I have two pieces of foam core that I use as backdrops. On all my pictures with white backgrounds (like the pouch and the tripod pictures above), I set the item on one piece and use the other piece behind the subject. The white reflects the light softly and makes a very nice background. Some people tape four pieces of foam core together in an open box shape and use that as a little photo studio for small items. The white sides help reflect more light on the subject so that you don't have to use flash. 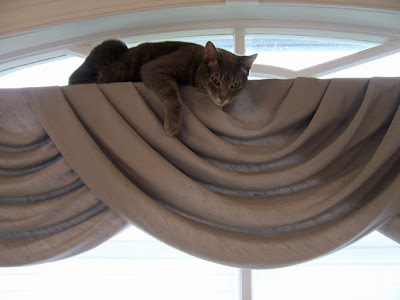 I also drape fabrics on my foam core boards and set the items on the draped fabric. It makes a nice little photo "booth." 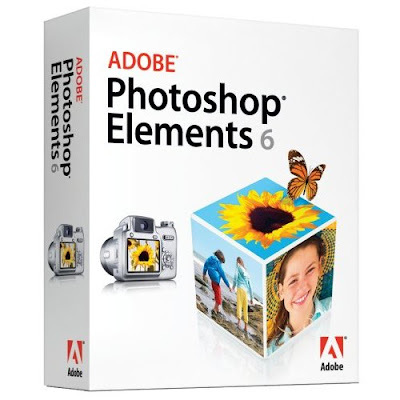 Photoshop Elements . Amazing. It corrects hue, lighting, skin tone, distortion, blur, crookedness...downright amazing. There is a steep learning curve, though, so be prepared to read a manual or something. It's the "lite" version of Photoshop, but I can't imagine that they left anything out...it's so fantastic! I learn something new every day. I correct EVERY picture on Photoshop Elements before you see it, usually using the "autofix" feature. Oh yeah, and the tool straightens out crooked pictures because I can't seem to take a level picture for anything. I'm in love with these blocks. I've got half the blocks made, and I love making them! Photoshop Elements: amazing. Marsha's Squiggle design: genius. 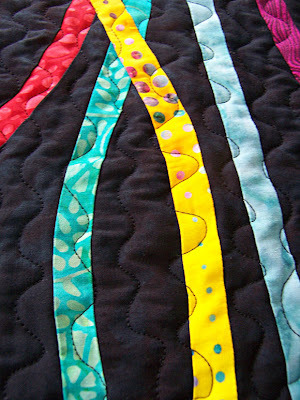 A few weeks ago, I visited Marsha at her blog "Threadbender" and saw her fabulous quilt, "Squiggles at Night." It was love at first sight. 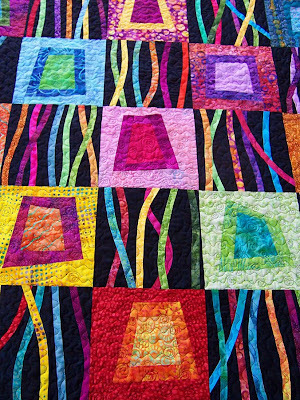 Her quilt is so whimsical and colorful and full of life--I just had to make one like it. 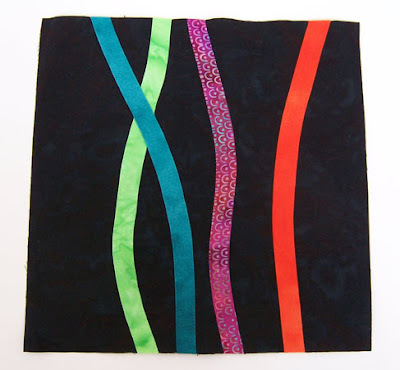 I emailed her and asked her if I could use her design to make a squiggle quilt of my own, and she kindly gave her permission. Thanks, Marsha! I am SO enjoying making your wonderful design. I'm squiggling with joy!! These are my first squiggles. Not bad, eh? Let me tell you, squiggling is addictive! All these beautiful colors on black are fun right now. 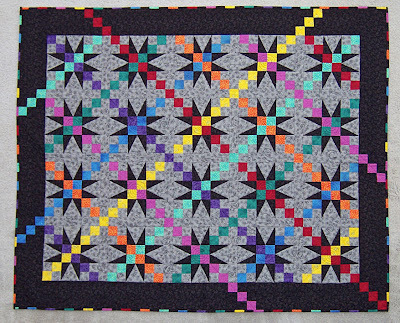 I haven't made a bright quilt in quite some time. Once I started squiggling, I just couldn't stop! The alternating blocks are Marsha's design, too. They're sort of wonky and free-pieced using Marsha's formula. 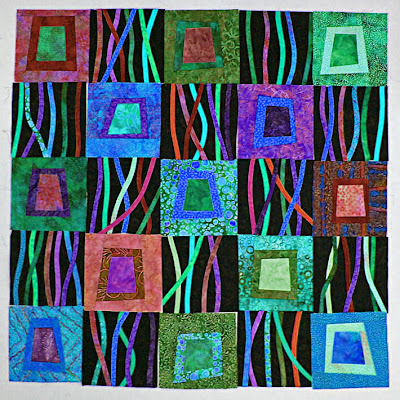 I think I'll name my Squiggles quilt, "Box Jellys" because to me, the squiggles look just like iridescent jellyfish tendrils streaming down from glowing box jellyfish. The "box" part is a little joke because the blocks are square like a box, see? Hee hee. I crack myself up. 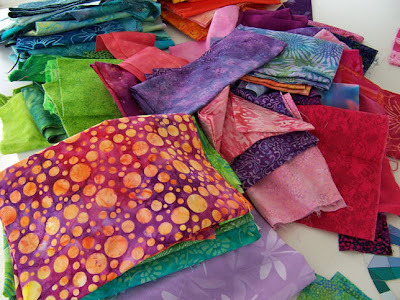 I spent the day totally blissed out in my sewing room, wading through my stacks of batiks. I started out with nice color-coordinated stacks, but a few hours in, total chaos ensued: Gosh, they're even beautiful in a big tangle. I haven't worked with batiks in a while; I think I was sick of them for a time. So dragging them out again for a project--and setting them against black--whoo hoo! I'm appreciating how beautiful they are all over again. And what does one wear if one is planning on spending an entire blissful day immersed in one's sewing room, playing with gorgeous fabric? Bedsheets, of course! This sheet skirt is the most comfortable thing EVER. As soon as I can get to Wal Mart to buy some more 1/2" non-roll elastic, I'm going to have a whole week's worth of these puppies. I may even make some lounge pants, too. Mr. Bigglesworth watched me all day from his curtain vantage point. He's probably wondering why I'm wearing my bed.